WASHINGTON — The captors of an American soldier held for nearly five years in Afghanistan have signaled a willingness to release him but are unclear which U.S. government officials have the authority to make a deal, according to two individuals in the military working for his release. Critics of the release effort blame disorganization and poor communication among the numerous federal agencies involved. An ever-shrinking U.S. military presence in Afghanistan has refocused attention on efforts to bring home Sgt. Bowe Bergdahl, who has been held by the Taliban since June 30, 2009. About two dozen officials at the State and Defense departments, the military’s U.S. Central Command, the Joint Chiefs of Staff, U.S. Special Operations Command, the CIA and FBI are working the case – most of them doing it alongside their other duties, a defense official said. Bergdahl’s captors are anxious to release him, according to a defense official and a military officer, who both spoke to The Associated Press only on condition of anonymity because they were not authorized to discuss the case publicly. “Elements in all echelons – from the top of the Taliban down to the folks holding Bergdahl – are reaching out to make a deal,” the defense official said. The military officer, who said the effort was marred by distrust on both sides, said those holding Bergdahl have indicated what they would be willing to do to prove to the U.S. government that they want to deal, but that the U.S. has not formally responded to that outreach. Bergdahl, 28, of Hailey, Idaho, was last seen in a “proof of life” video released in December. He is thought to be held by members of the Haqqani network, which operates in the Afghanistan-Pakistan border region and has been one of the deadliest threats to U.S. troops in the war. The Haqqani network, which the State Department designated as a foreign terrorist organization in 2012, claims allegiance to the Afghan Taliban, yet operates with some degree of autonomy. Rep. Duncan Hunter, R-Calif., wrote earlier this year to Defense Secretary Chuck Hagel, saying it was critical that efforts to free Bergdahl are not overcome by bureaucracy. 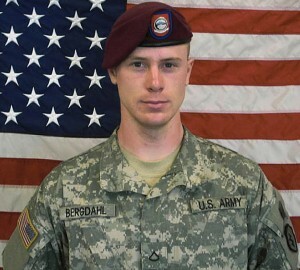 “Given the significance and necessity for centralized command and control, which I have been informed is little to nonexistent, I urge you to seriously consider the idea of directing an individual to organize, manage and coordinate activity that involves multiple elements of the federal government working toward Bergdahl’s release,” wrote Hunter, a Marine veteran of both Iraq and Afghanistan. Days later, Hagel appointed Michael Lumpkin, assistant defense secretary for special operations and low-intensity conflict, as the point person for the Bergdahl case at the Pentagon. Hunter viewed that as a good step but noted that Lumpkin only has jurisdiction over the Pentagon work, not the other agencies. A month after Lumpkin’s appointment, Hunter wrote President Barack Obama, asking him to make the Defense Department the lead on all efforts to get Bergdahl back “with the specific aim of achieving a faster resolution than can be provided by the Department of State.” He also asked Obama to name one coordinator to oversee the entire Bergdahl effort. The State Department is leading the most publicized approach to getting Bergdahl back – a plan to exchange him for five Taliban detainees at the U.S. military prison at Guantanamo Bay, Cuba. The department declined comment on Hunter’s letters and referred questions to the White House. “The reason Sgt. Bergdahl remains a captive is because he is being held by a terrorist organization, not because of a lack of effort or coordination by the U.S. government,” said Caitlin Hayden, spokeswoman for the National Security Council. The defense official and military officer paint a different picture. When the Hagel’s office and CENTCOM separately learned about the Bergdahl video in December, there was confusion about who should tell the family, the defense official said. The secretary’s office ended up informing the family. That angered CENTCOM, which believed it was its responsibility to tell the Bergdahls. Neither was communicating with the other about the video notification, the defense official said. In August 2012, Obama contacted Bergdahl’s parents weeks after they expressed frustration that the government wasn’t doing enough to secure their son’s freedom. But in May 2013, Bob Bergdahl told a POW/MIA gathering in Washington that he was pleased with the government’s efforts to bring his son home. Navy Cmdr. Amy Derrick-Frost, a Defense Department spokeswoman, also defended the effort, saying the Pentagon was committed to the safe and immediate release of Bergdahl and saying Lumpkin was spearheading the “comprehensive synchronization” of efforts throughout the department and with other agencies. The Pentagon is exploring several avenues to get Bergdahl released, including one that seeks to negotiate with the Haqqani network, according to an individual familiar with the government’s efforts. The person, who spoke on condition of anonymity because he was not authorized to publicly discuss the Pentagon’s efforts, said some government officials also are looking into ways to seek the simultaneous release of Bergdahl and four civilians, including a woman who was pregnant when she went missing, believed held by militants. All avenues are fraught with difficulties. In late February, the Taliban said they had suspended “mediation” with the United States about swapping Bergdahl for the five Taliban detainees, blaming the “current complex political situation” in Afghanistan. There also is some congressional opposition to the prisoner swap. According to military documents, one of the five served as interior minister during the Taliban’s five-year rule of Afghanistan and had direct ties to Osama bin Laden. McCain, who was a prisoner of war in North Vietnam for more than five years, also said Obama administration officials first told Congress that they wanted to release five Taliban detainees at Guantanamo as a confidence-building measure to jump-start talks with the Taliban.